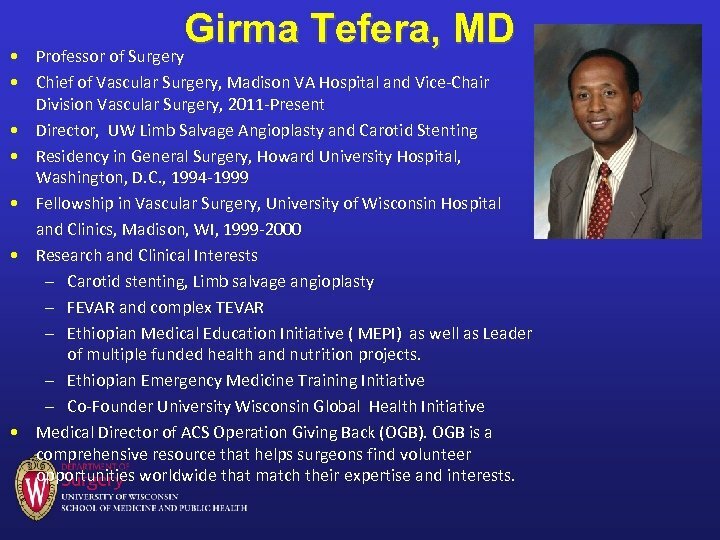 Girma Tefera, MD Professor of Surgery • • Chief of Vascular Surgery, Madison VA Hospital and Vice-Chair Division Vascular Surgery, 2011 -Present • Director, UW Limb Salvage Angioplasty and Carotid Stenting • Residency in General Surgery, Howard University Hospital, Washington, D. C. , 1994 -1999 • Fellowship in Vascular Surgery, University of Wisconsin Hospital and Clinics, Madison, WI, 1999 -2000 • Research and Clinical Interests – Carotid stenting, Limb salvage angioplasty – FEVAR and complex TEVAR – Ethiopian Medical Education Initiative ( MEPI) as well as Leader of multiple funded health and nutrition projects. 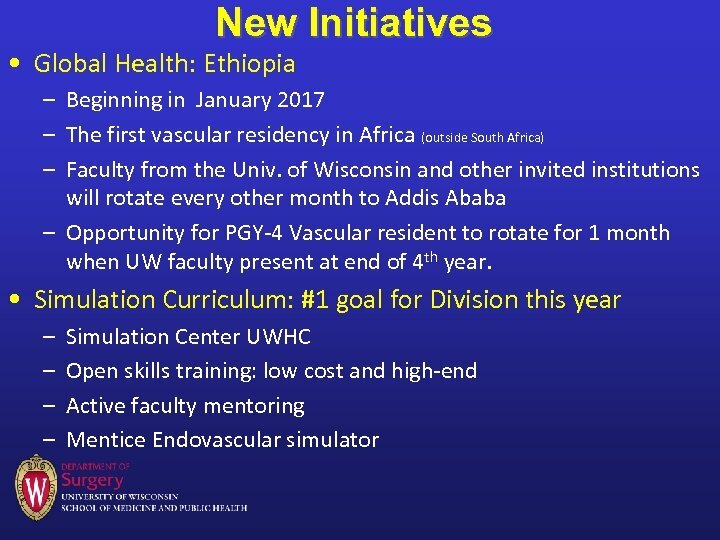 – Ethiopian Emergency Medicine Training Initiative – Co-Founder University Wisconsin Global Health Initiative • Medical Director of ACS Operation Giving Back (OGB). 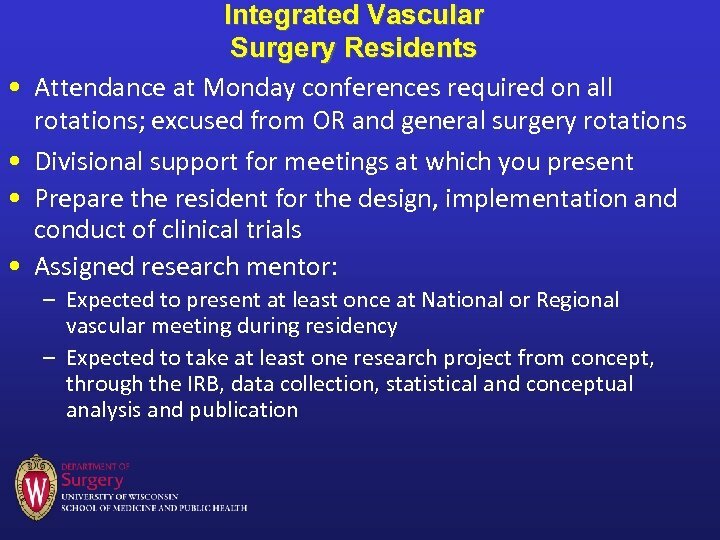 OGB is a comprehensive resource that helps surgeons find volunteer opportunities worldwide that match their expertise and interests. 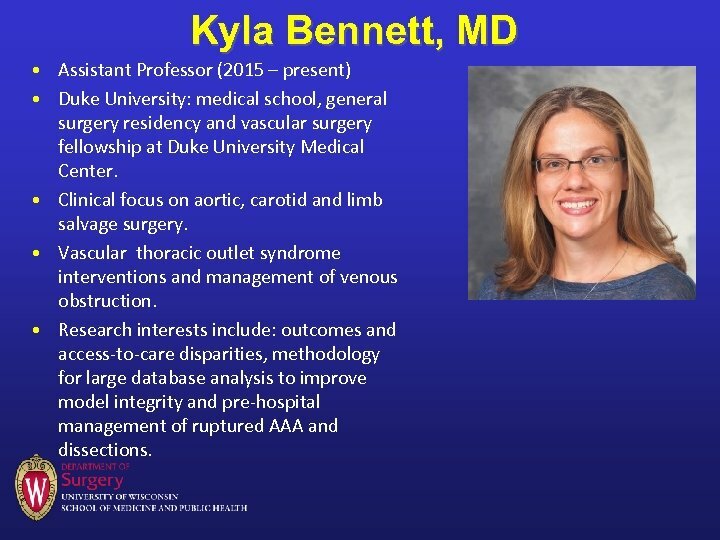 Kyla Bennett, MD • Assistant Professor (2015 – present) • Duke University: medical school, general surgery residency and vascular surgery fellowship at Duke University Medical Center. 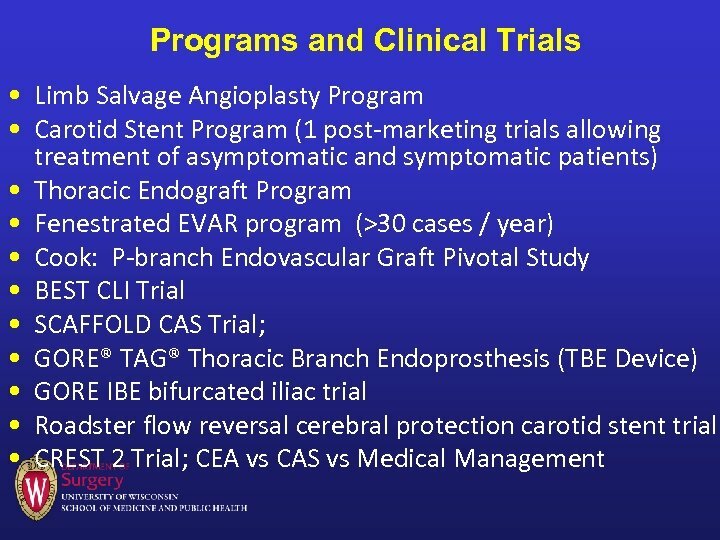 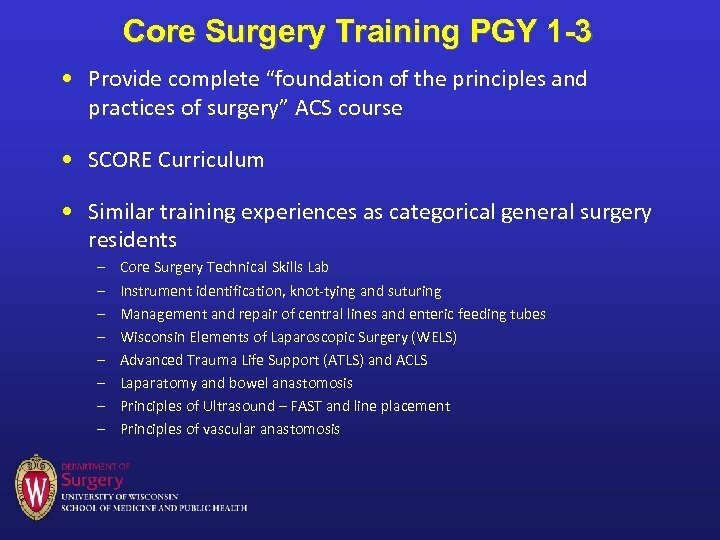 • Clinical focus on aortic, carotid and limb salvage surgery. 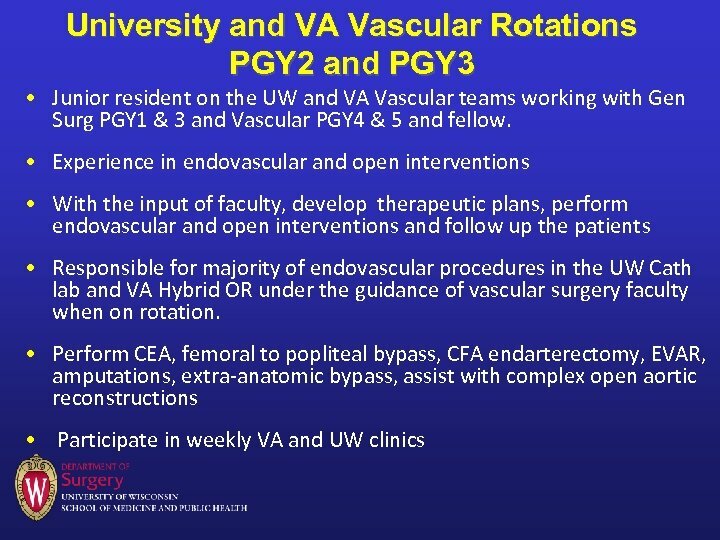 • Vascular thoracic outlet syndrome interventions and management of venous obstruction. 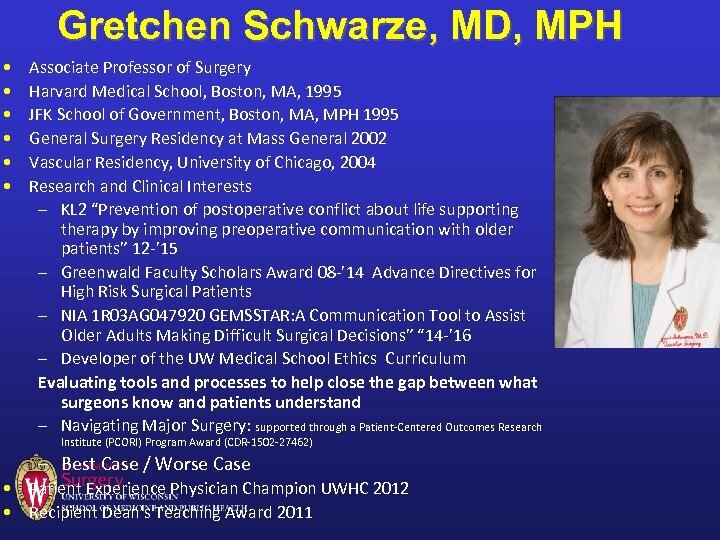 • Research interests include: outcomes and access-to-care disparities, methodology for large database analysis to improve model integrity and pre-hospital management of ruptured AAA and dissections. 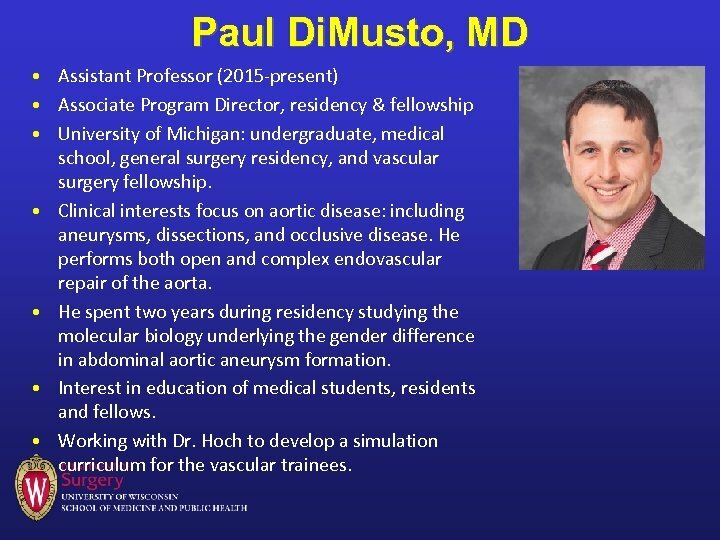 Paul Di. 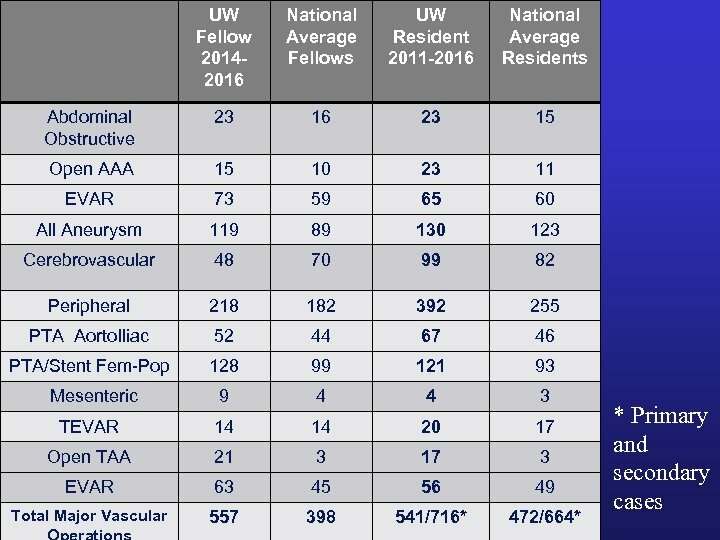 Musto, MD • Assistant Professor (2015 -present) • Associate Program Director, residency & fellowship • University of Michigan: undergraduate, medical school, general surgery residency, and vascular surgery fellowship. 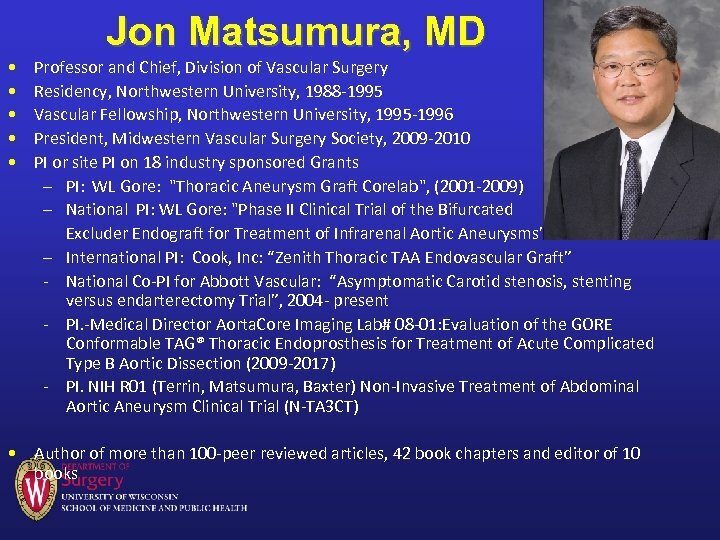 • Clinical interests focus on aortic disease: including aneurysms, dissections, and occlusive disease. 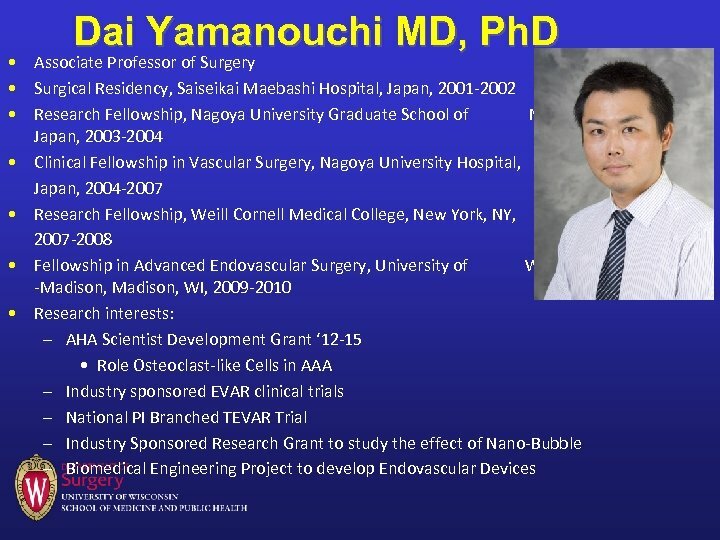 He performs both open and complex endovascular repair of the aorta. 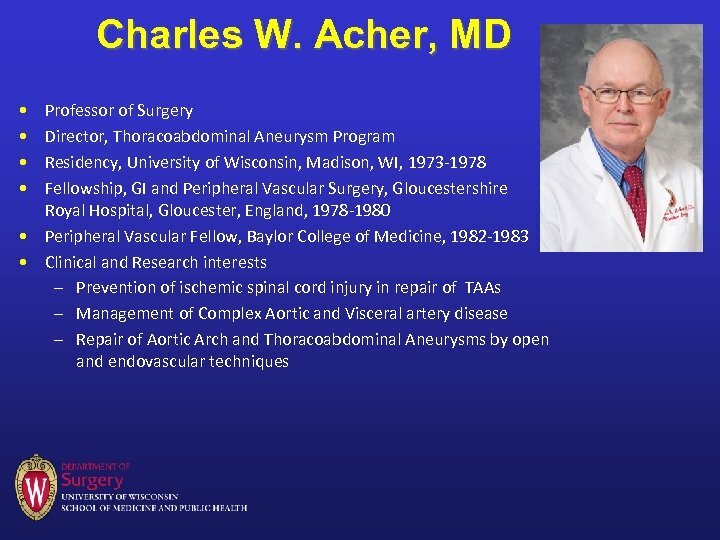 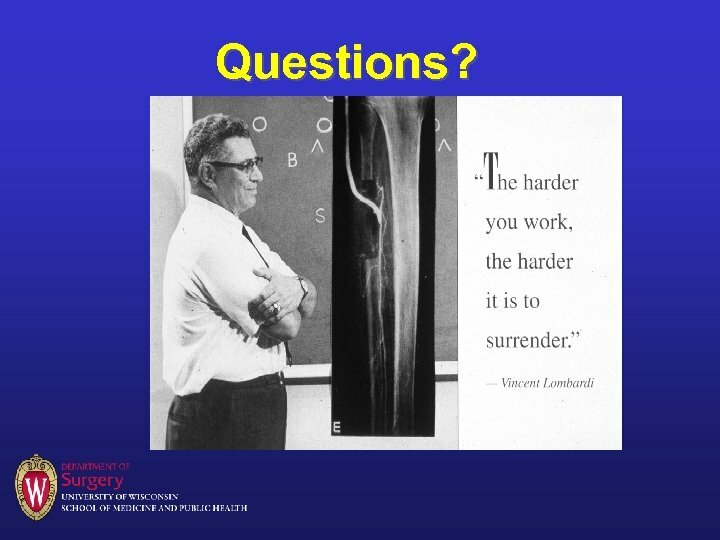 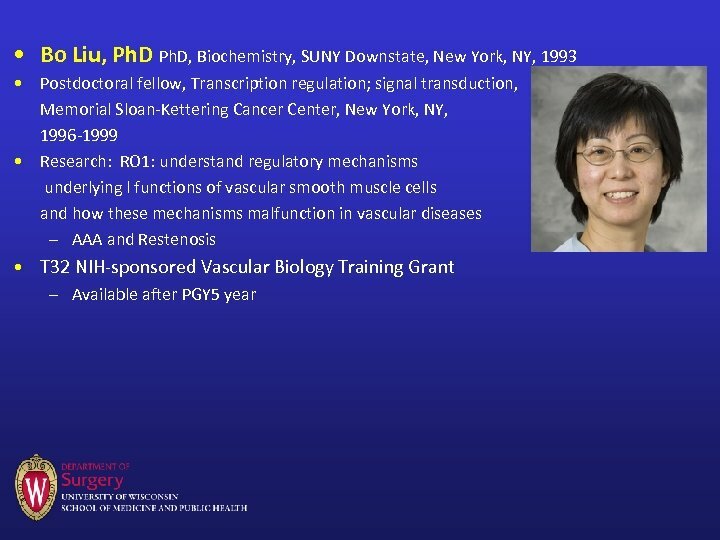 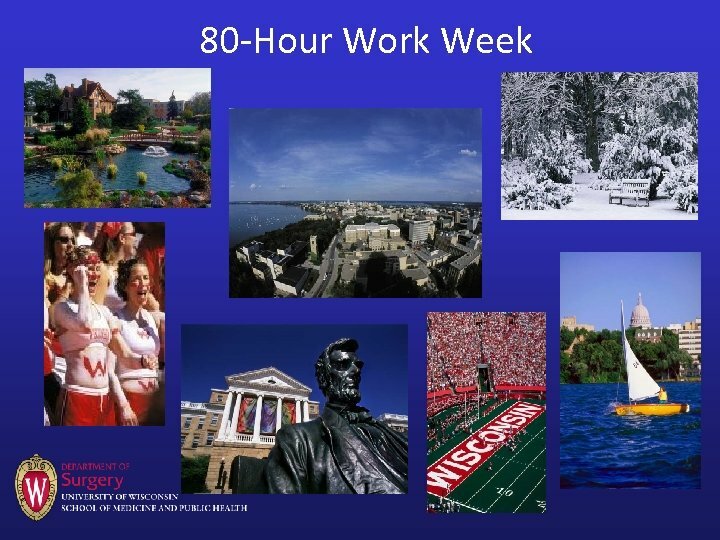 • He spent two years during residency studying the molecular biology underlying the gender difference in abdominal aortic aneurysm formation. 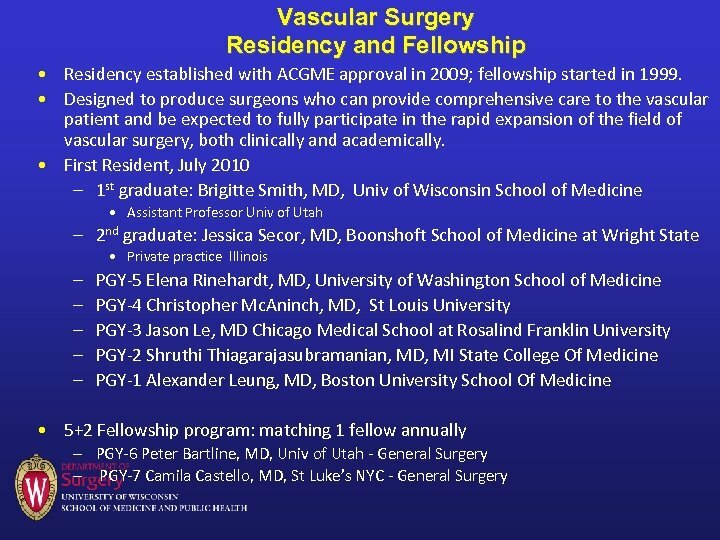 • Interest in education of medical students, residents and fellows. 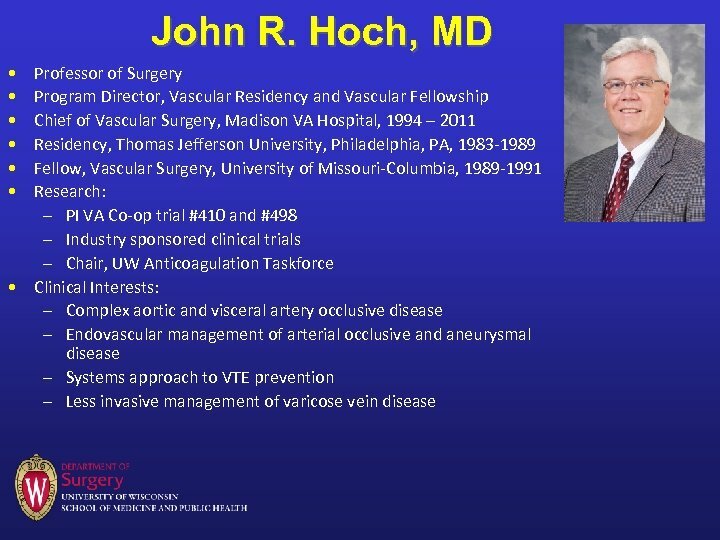 • Working with Dr. Hoch to develop a simulation curriculum for the vascular trainees. 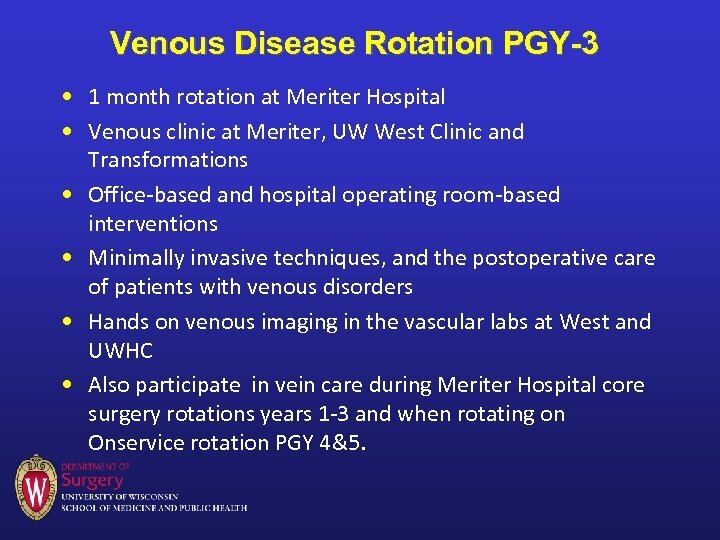 Venous Disease Rotation PGY-3 • 1 month rotation at Meriter Hospital • Venous clinic at Meriter, UW West Clinic and Transformations • Office-based and hospital operating room-based interventions • Minimally invasive techniques, and the postoperative care of patients with venous disorders • Hands on venous imaging in the vascular labs at West and UWHC • Also participate in vein care during Meriter Hospital core surgery rotations years 1 -3 and when rotating on Onservice rotation PGY 4&5. 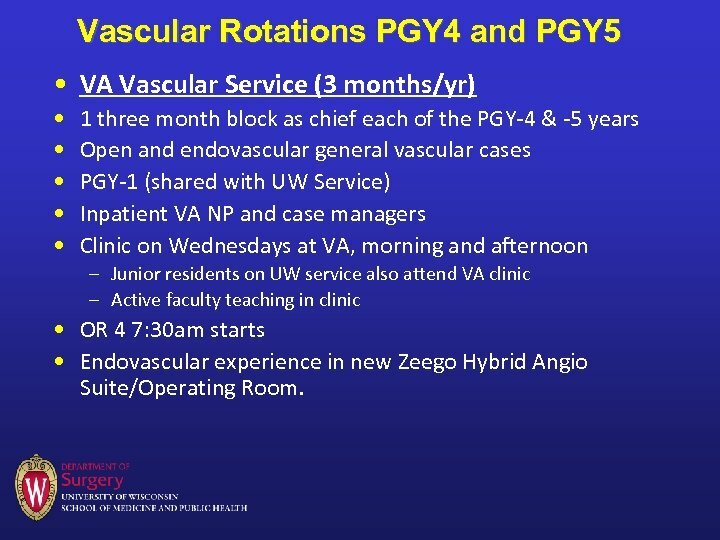 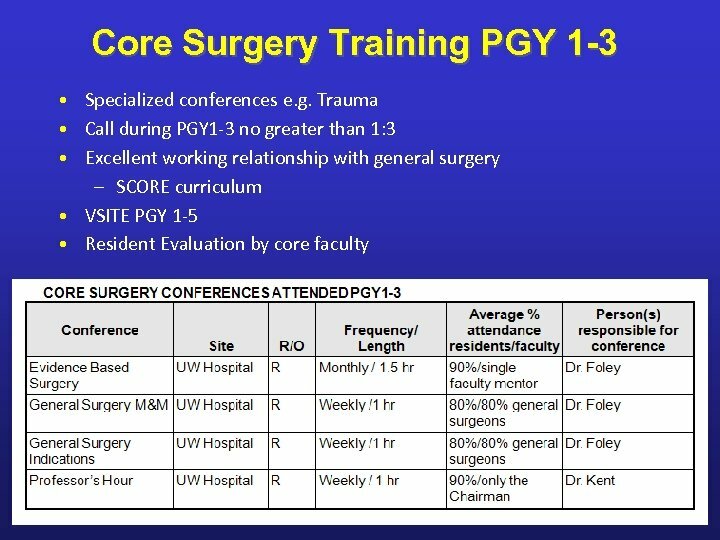 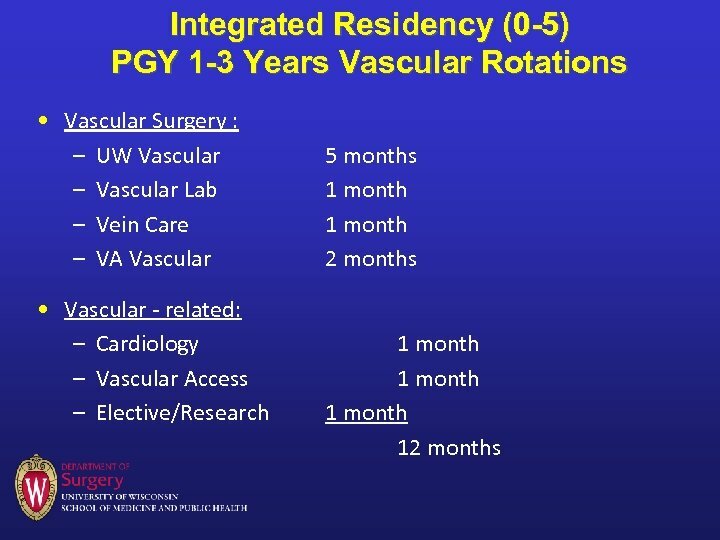 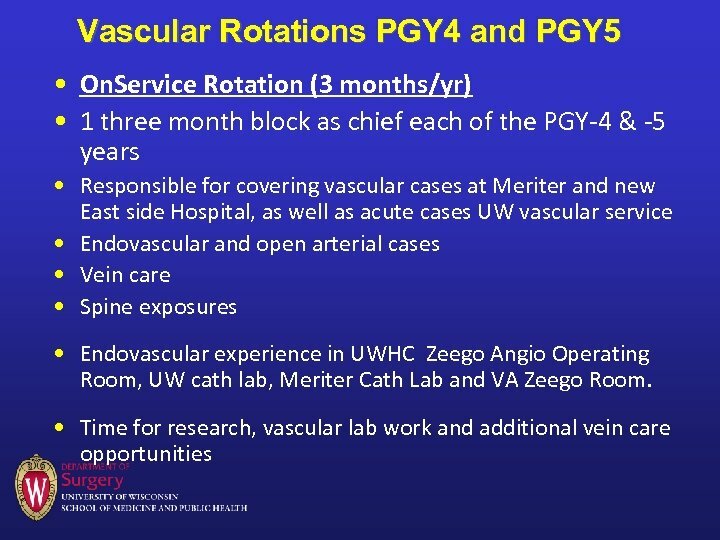 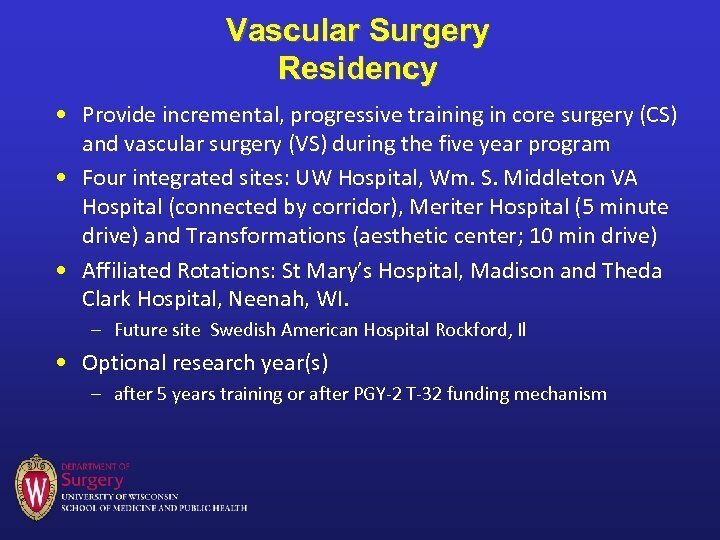 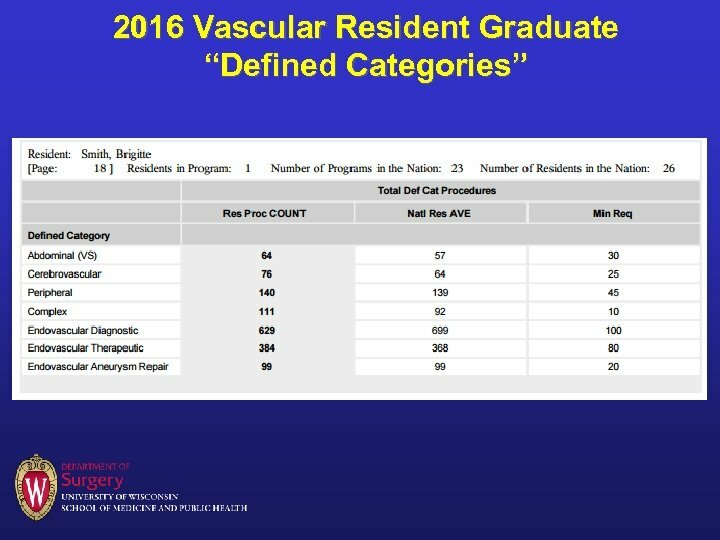 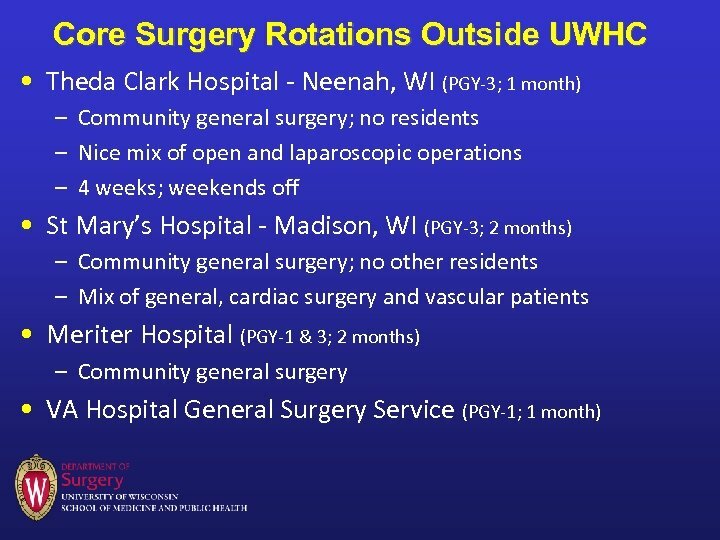 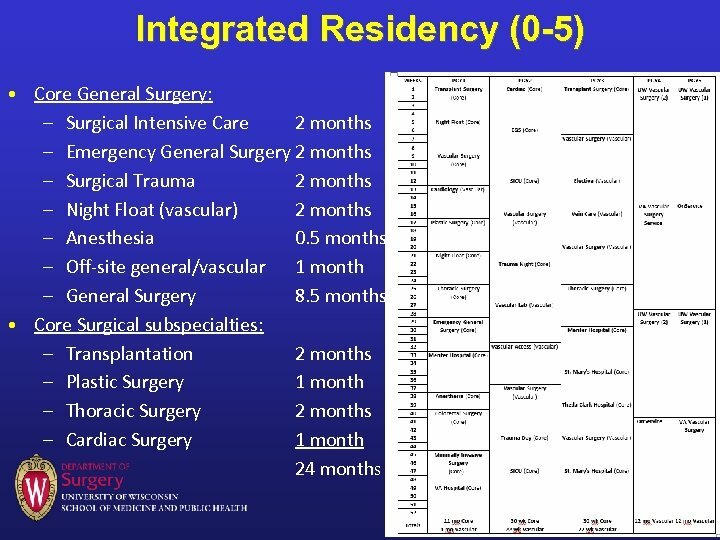 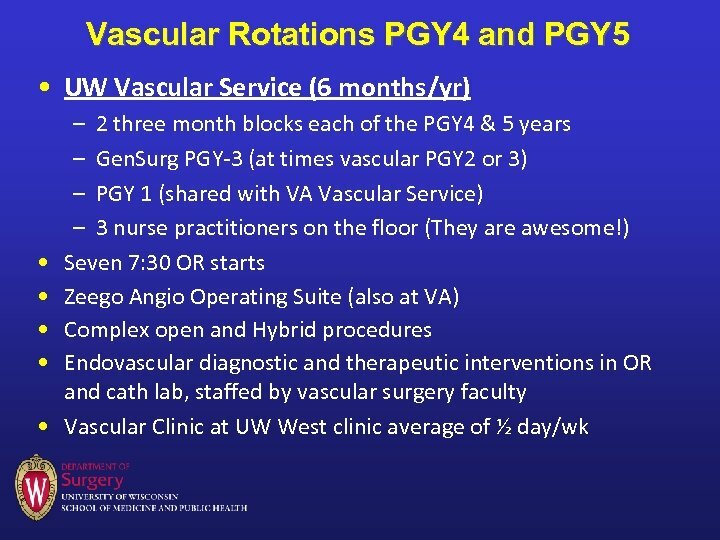 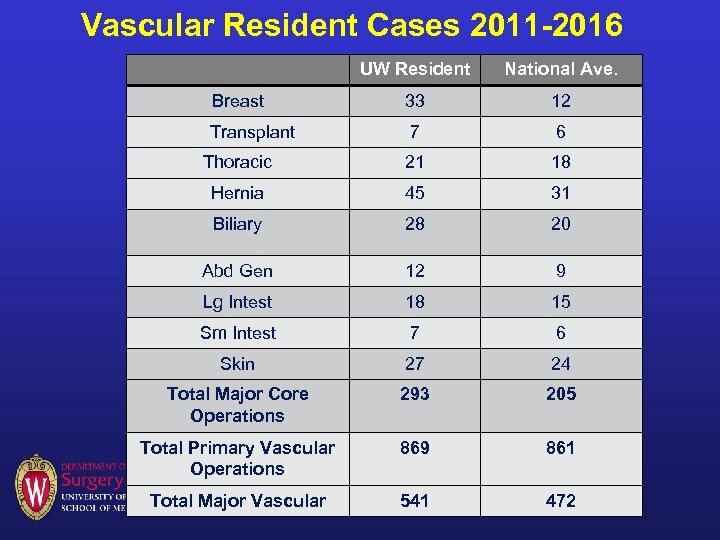 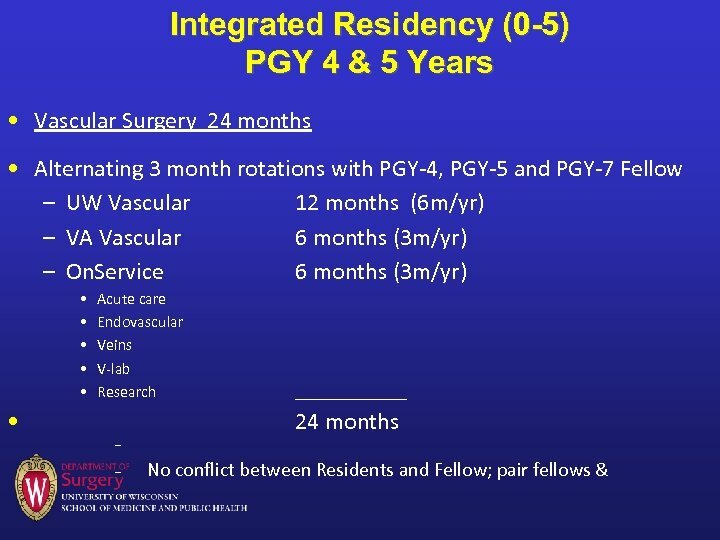 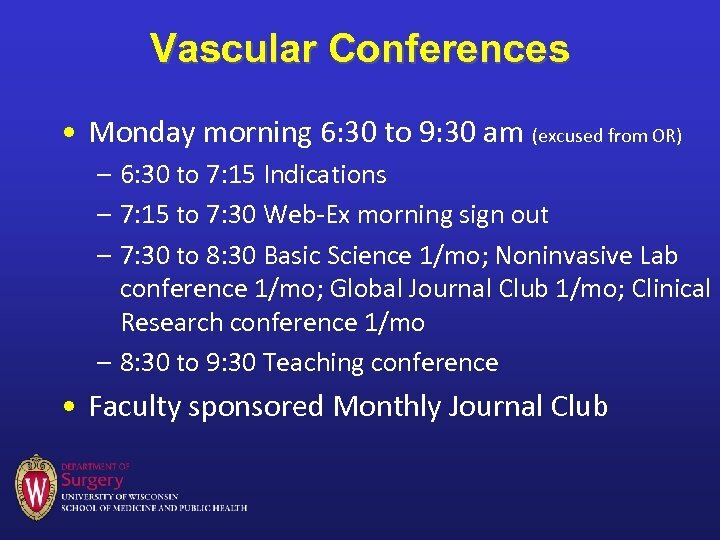 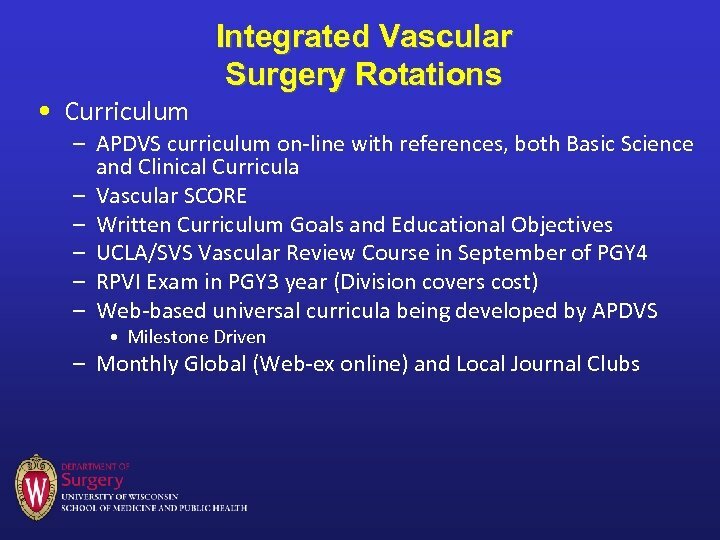 Vascular Rotations PGY 4 and PGY 5 • VA Vascular Service (3 months/yr) • • • 1 three month block as chief each of the PGY-4 & -5 years Open and endovascular general vascular cases PGY-1 (shared with UW Service) Inpatient VA NP and case managers Clinic on Wednesdays at VA, morning and afternoon – Junior residents on UW service also attend VA clinic – Active faculty teaching in clinic • OR 4 7: 30 am starts • Endovascular experience in new Zeego Hybrid Angio Suite/Operating Room. 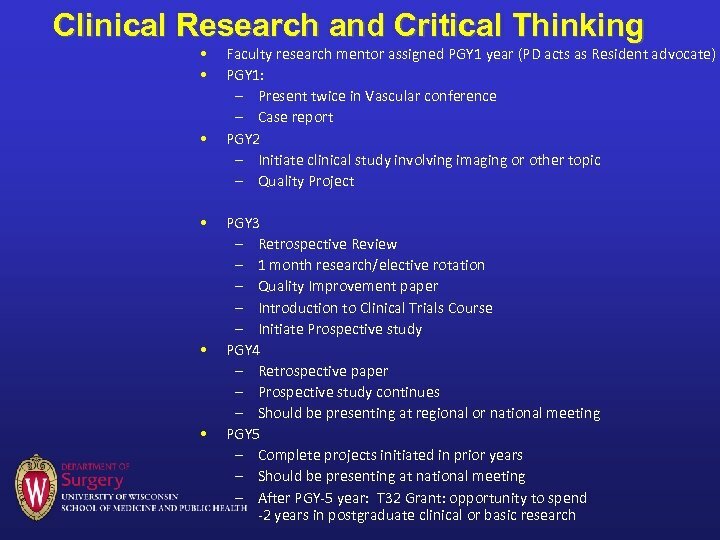 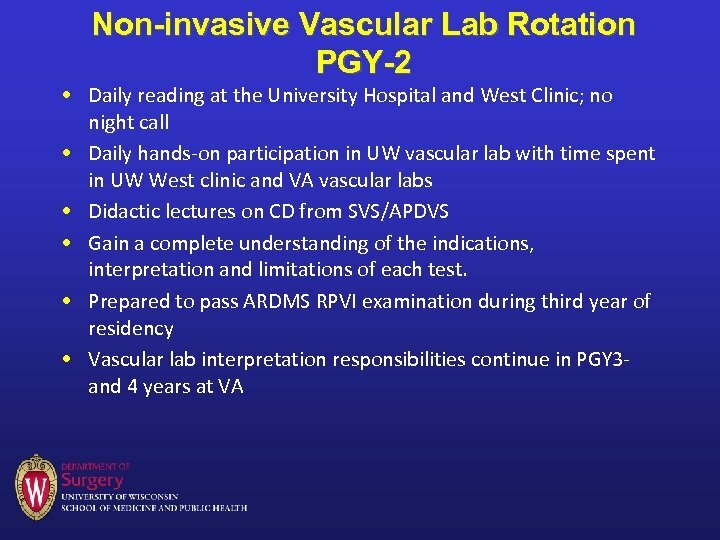 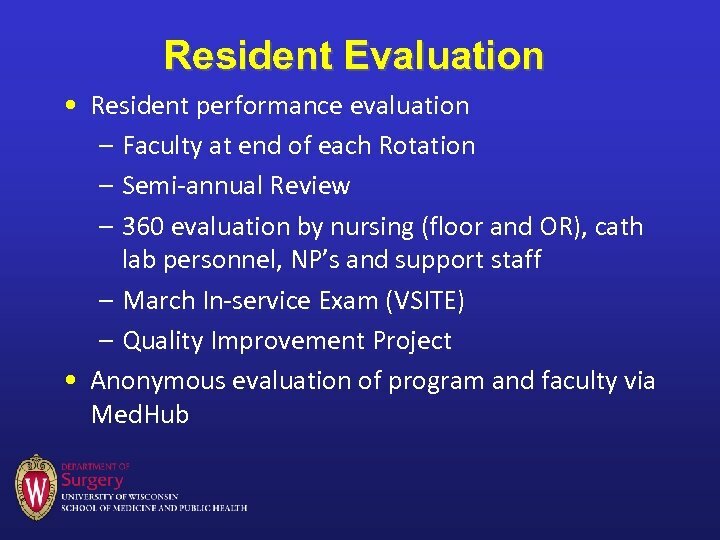 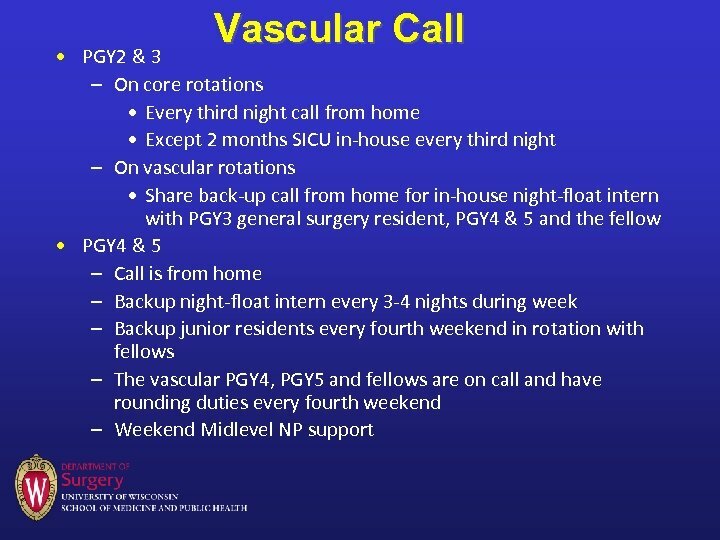 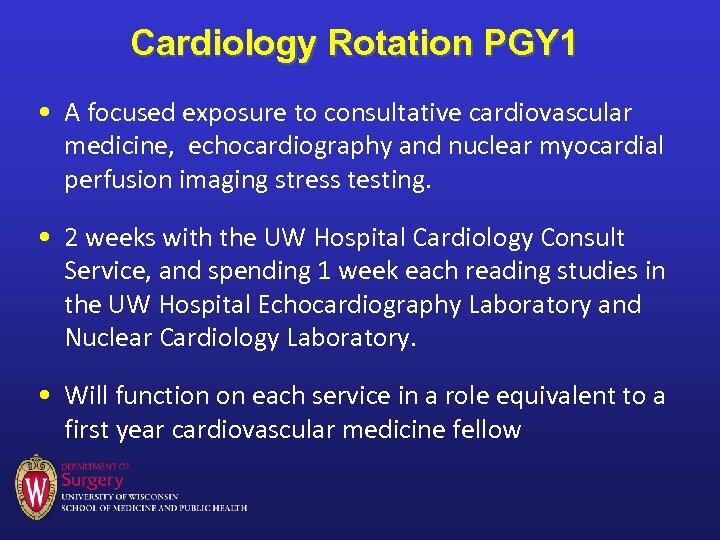 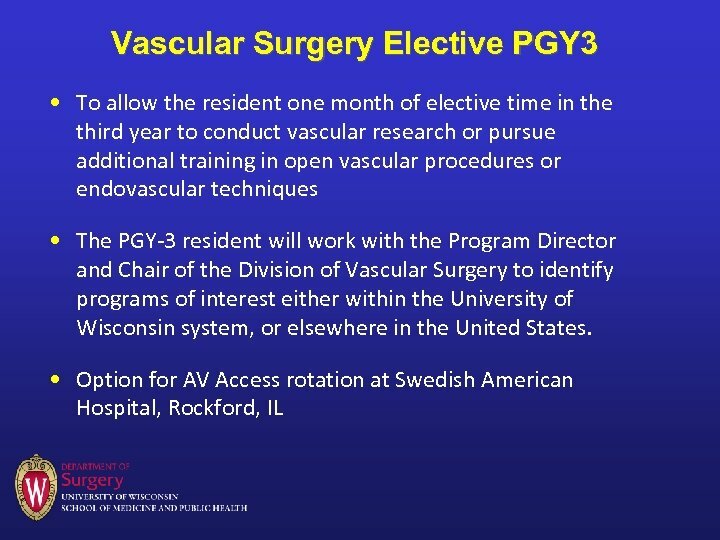 Vascular Imaging Rotation PGY 2 • The PGY-2 vascular resident will rotate for 1 month on the Vascular Imaging Service which includes CT and MR vascular imaging. 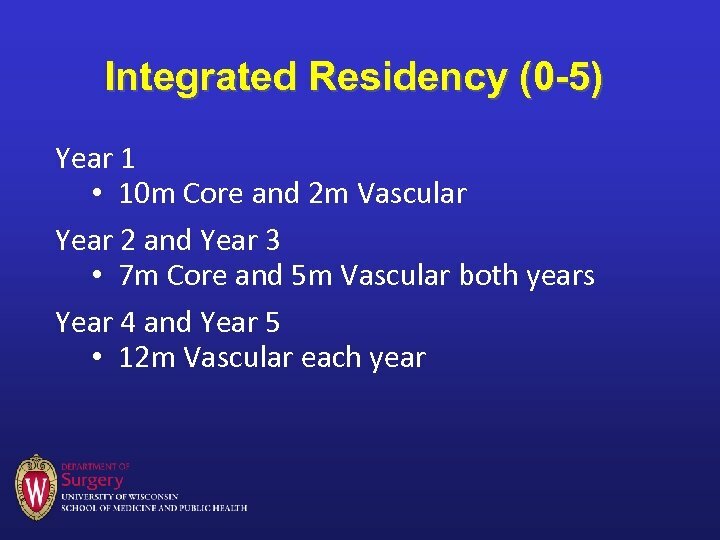 • Demonstrate an understanding of the principles and practice of modern vascular cross sectional imaging using computed tomography and magnetic resonance imaging. 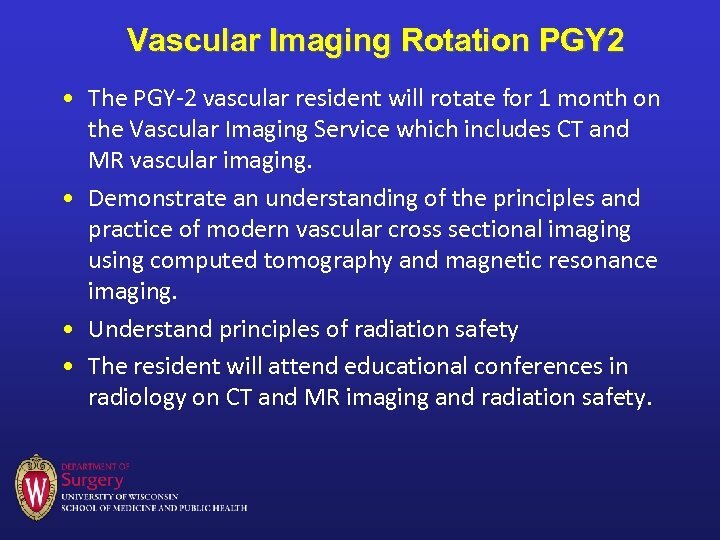 • Understand principles of radiation safety • The resident will attend educational conferences in radiology on CT and MR imaging and radiation safety.